Florida Book News: Deborah Sharp's Fourth Mystery Launches on September 8. Deborah Sharp's Fourth Mystery Launches on September 8. Jumpin' Jehoshaphat, what has a Hollywood movie company wrought in Himmarshee, Fla? Spoiled stars. Conniving crew members. And, of course, that little matter of a murder . . . The official curtain's about to rise on MAMA SEES STARS (Midnight Ink, September 8, 2011). Library Journal hands MAMA a starred review: "This zany fourth entry in Sharp's series is a feature worthy of the big screen . . . The mystery aisles can always use more humor, and Sharp delivers." Kirkus's reviewer says two thumbs up: "Sparks fly when Hollywood comes to Himmarshee . . . An amusing tale of life and love in the kind of Florida town tourists rarely see." Deadly Pleasures likes it: "Mama proves she has a talent for acting, as well as acting up." Have y'all been perspiring up a puddle like we have in Himmarshee? The calendar may say nearly fall, but the swelter says summer. Middle Florida is so hot, the hens are laying hard-boiled eggs! Ms. Fancy Pants Author Deborah Sharp has offered me a word or two before she takes over. Big of her, right? I don't know why she doesn't let me write the whole thing. After all, I'm the one in the star-studded cowboy movie the Hollywood folks shot in Himmarshee. I noticed nobody asked Ms. Author to stand in front of the cameras. She claims she's happy behind the scenes. Don't buy it. If they offered to make her a star, she'd knock down her granny getting there. Even so, she did a pretty good job writing down what happened when those nutty Left Coasters invaded our town. You can read all about it in MAMA SEES STARS. I was right there when we discovered that nasty producer murdered, his body strung up on the fence of the movie's horse corral. Just about the last thing he did before he went to his maker was scream at me for ruining a scene, which of course I did not do on purpose. I'm not saying Norman Sydney got what he deserved for disrespecting Mama, but I wasn't alone in cursing his name. Did you know this is the fourth mystery novel starring me? Ms. Fancy Pants will try to tell you my middle daughter, Mace Bauer, is the main character. I'll just point out each of the books has Mama right in the title. Go to your favorite bookstore, or you can order STARS off the Wide World of the Web. Click HERE for Amazon, or HERE for Barnes & Noble. Or, support small business by buying from an independent bookstore. If you ask me, though, it should be me, and not Ms. Author, signing those books. Look me up at one of my red-carpet soirees. I'll see what I can do . . . if my autograph line isn't too long. Hello, the infamous Ms. Fancy Pants Author here. 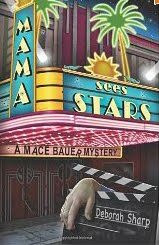 I hope you can make a red-carpet event for the movie-themed MAMA SEES STARS. PS: The first title in my series, MAMA DOES TIME, is available for a short time FREE as download for both Amazon's Kindle and Barnes & Noble's Nook. Did I mention, FREE :-) ?